Edition: From L’Estampe Moderne vol. 1, no. 5, September 1897; printed by L’Imprimerie Champenois, distributed by Masson & Pizza. 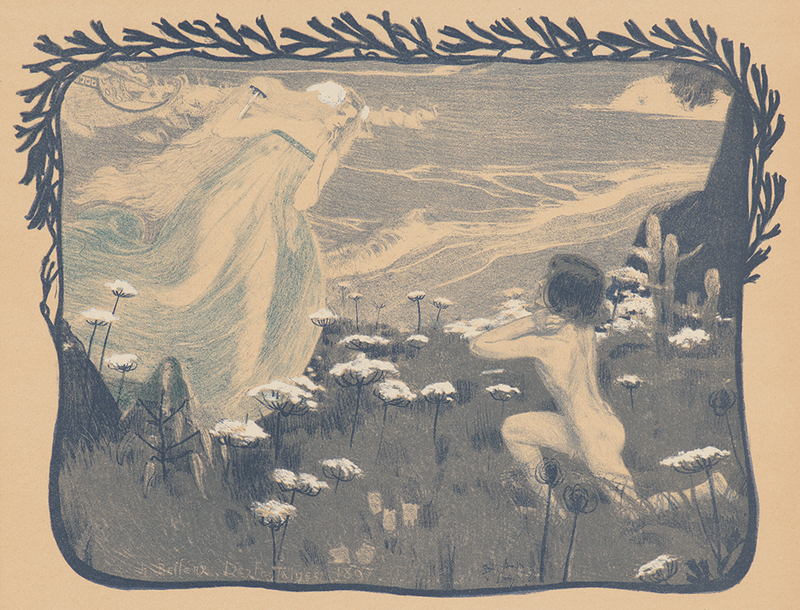 L’Estampe Moderne was published from 1897 to 1899 in two volumes comprising 103 prints (the DAC also has one set of 4 duplicates and 3 premium prints); about 34–37 are not original but are reproductions or collotypes. L’Illusion, . From L’Estampe Moderne. Color lithograph on wove paper. Sheet: 405 x 308 mm (15.9 x 12.1 in.). DAC accession number 1959.18.1.18. Purchase funds, 1959. Open Access Image from the Davison Art Center, Wesleyan University (photo: M. Johnston). http://dac-collection.wesleyan.edu/obj2469 is a persistent link to this page with no user-session information.